New age, old age, any age: they fit wherever. Angels are the symbol of eternity. Of serenity. Of ablution. A sure sign that one is bound heavenwards. And I have such a story of angels today as will make you gasp with amazement and ask: How? How is it we never heard this before? Dictators can be brutes. They stand on the shoulders of those who used talent and guile to get themselves where they are. They stand there, sanctioned by power, and take what they want. Such a dictator was Henry VIII, and a man with girth like that demanded strong shoulders indeed. You will all be familiar with one such set of shoulders, a butcher’s lad who rose to be Henry’s right hand man: a man of god, a man of letters and a man of wealth and taste. Cardinal Thomas Wolsey. The man who remodelled Hampton Court as a Renaissance Cardinal’s Palace, who stood astride the English world like a colossus, and who, like most of Henry’s props, fell suddenly. Henry wanted to remarry, and Anne Boleyn’s people convinced him Wolsey was slowing things down. He arranged Wolsey’s toppling with a charge of treason (Wolsey cheated him by dying of natural causes on the way home) and then nabbed Hampton Court. This much is plain, common knowledge. Poor Wolsey. His plans for his death were elaborate. He had one of the foremost sculptors of the day, Benedetto De Rovezzano – a man who could sculpt Elysium with his lithe fingers – and Giovanni Da Maianno create a tomb fit for an emperor. At its four corners stood four heavenly angels. Not just your average stone angels. These were something sublime: something so beautiful it still takes one’s breath away, just to see them. Henry acquired the tomb, of course. He took one look and thought: I shall better that. And he went back to Benedetto, and demanded it be transformed into an even grander tomb. I have told the story of the tomb before: how all Henry’s schemes came to nothing because his taciturn daughter allowed them to flounder. He never got his tomb, and was buried in a vault beneath St George’s Chapel in Windsor Castle. Nelson got the black sarcophagus eventually. No-one knows what happened to them. They disappeared without trace, moved first to Windsor Castle and sold off during the Civil War. The trail had gone cold. Sotheby’s Auction House, 1994: a lot labelled “Two bronze angels in the Renaissance style” went up for sale. It took an art historian and some considerable resources to realise that these were two of the four missing angels from Wolsey’s tomb. And once you know what you are looking for, the angels are easier to spot. The other two were tracked down at Harrowden Hall in Northampstonshire. For centuries, it transpired, all four angels had stood together at the Hall’s gates. Now they are with two different owners, though they are on temporary display in Gallery 50 of the Victoria and Albert Museum in London. The Museum has an appeal to raise the £5 million it will take to reunite them permanently. Such angels should be together,surely? Posted in Quirks of HistoryTagged Angels, Britain, Henry VIII, heritage, history, London, UK, Victoria and Albert Museum, WolseyBookmark the permalink. Nothing at all angelic about Hennery the Hate-th. I’m glad he didn’t get them. Pity they had a bit of a tiff and split up, though. It’s always a shame when pieces such as these are split apart, when they have such history. I think they should be reunited, Kate. Me too, Tom. Now, if the V&A could just raise the requisite amount….I notice there are collecting boxes next to them in the museum! Deer are determined creatures, aren’t they, Penny? Sometimes it takes awhile for a wrong to be made right. I, too, think they should be reunited; maybe at the site of the Cardinal’s actual tomb? It appears from photos that there would be space there for them. Ah, where the Cardinal is buried. Now there’s another story. They lost him: he died near Leicester and was buried in 1530 at the Abbey, but no-one knows where…now, fresh from the success of finding Richard III, the town’s university wants to relocate him! You live and learn: thanks Kate, another intriguing post. Now, nobody’s asked the obvious questions, so I will. How do we know these are angels? Conventional angels have wings; these don’t, or if they had (made from a different material?) they lack them now. 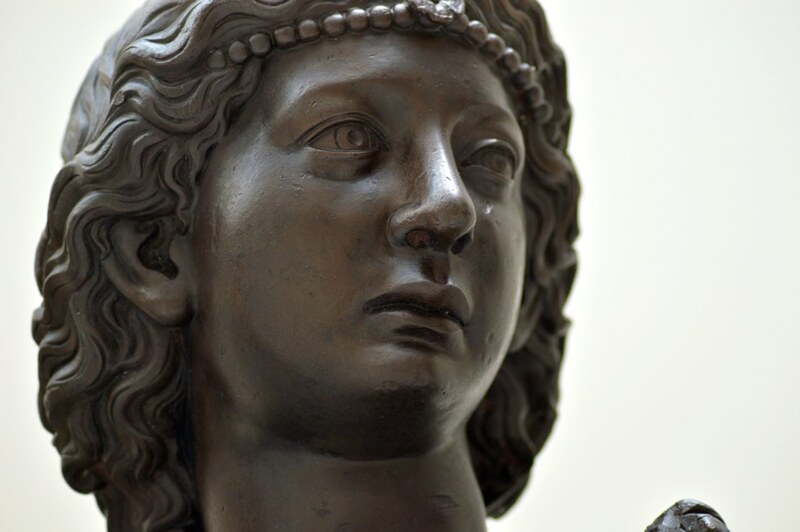 Conventional angels (unless they are identifiably male, like Michael — who might be the one with a helmet) are feminine or are at least androgynous in appearance. These figures are undoubtedly not the latter. Where are the other angelic identifiers: the thuribles, the flowing robes that cover their nakedness? These are classical supporters not classic heavenly creatures. And what are they carrying? Candlesticks? I’m not convinced. Poles for standards? Possibly. I find it all rather curious. Or are you planning further revelations in a follow up post? Once again you are able to take a little piece of history and make into an intriguing blog post. I find it interesting that two of the statues have the original copper/bronze patina from being exposed to the elements while two appear to have been cleaned at some point or been kept inside. As much as antique collectors look for the “natural aging” on items, I think the two non-patina statues are truer to their original form. Thanks for sharing what I could never afford to see in London! Very, very cool. Wonder all the things they saw in the intervening years. Mind you, I’m sure these angels love being stared at and had no intention of turning sci-fi on you. I also love the way that Mary got her “revenge” on the father that set her aside like an old shoe – as an ex student put it so academically. I didn’t blink once 😀 I love the fact that Henry never got eternal glory, and was instead bunged in with Charles I under the floorboards. Serves him right. 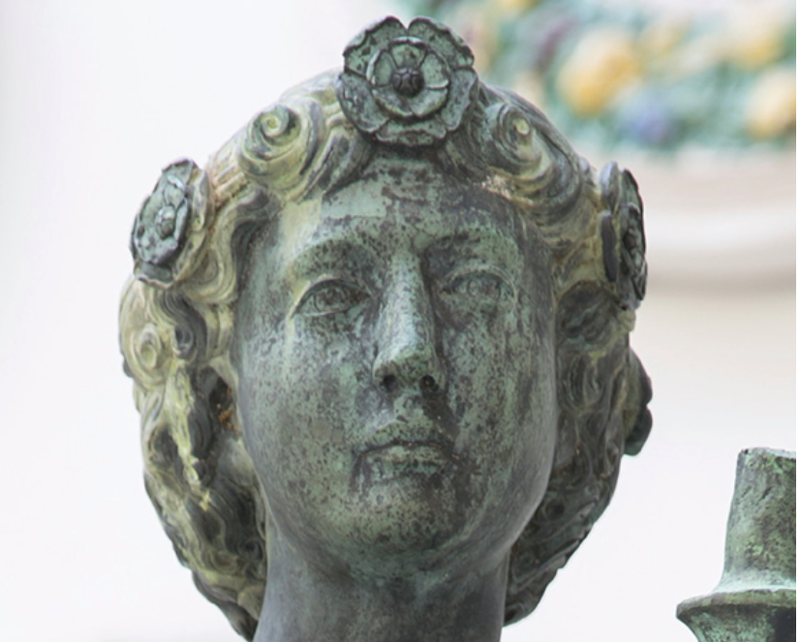 What tomb did Wolsey get? To be fair, seems like the angels should go to his burial spot, since I suppose he paid for them. Or maybe to Benedetto’s descendants. This story had me clapping my hands at the delight of finding the angels after their lengthy and mysterious disappearance. What joy there would be in being an art detective under such circumstances! Ah, yes; last night I was watching the episode where they emerge from out of the snow. Really chilling…. It’s a gag a minute here at Kate Shrewsday…. Who should drive the Millennium Falcon?